As files on your distribution point(s)—Before you can run a script in this type of environment, the script must exist on the distribution point you plan to deploy it from and in Jamf Pro. You can add the script to the master distribution point by adding it to Jamf Admin. Then you can add the script to other distribution points via replication. Choose a priority for running the script during imaging. Specify operating system requirements for running the script. When you add, edit, or delete a script in Jamf Admin, the changes are reflected in Jamf Pro and vice versa. Adding a script to Jamf Admin adds the script to the jamfsoftware database or the master distribution point, and to Jamf Pro. Drag the script to the main repository in Jamf Admin. The script is displayed in blue text in the Unknown category until you add it to a category. Double-click the script in the main repository. Click the General tab and configure basic settings for the script, including the display name and category. 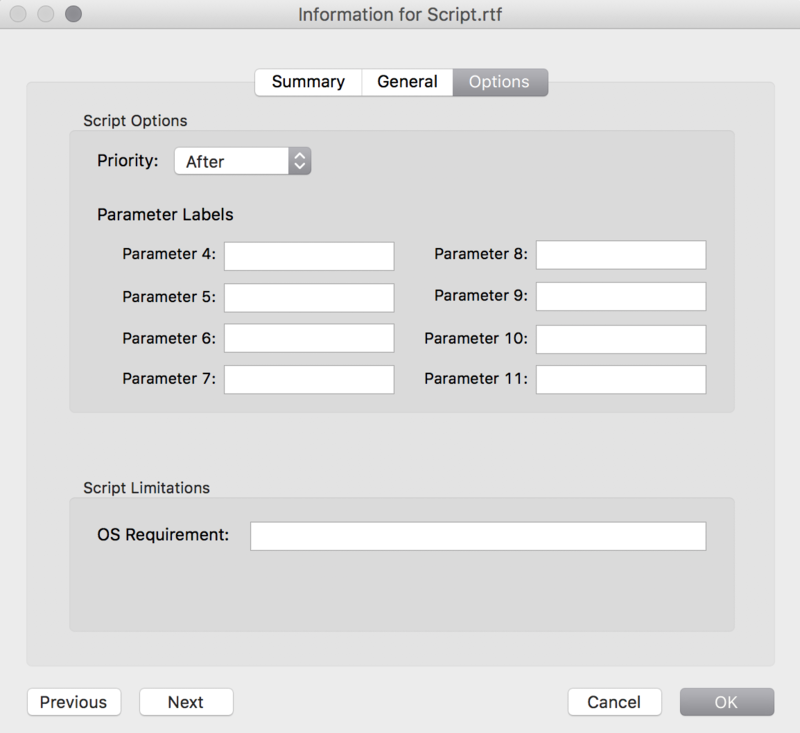 Click the Options tab and configure additional settings for the script, including the priority and parameter labels. If your environment is one in which scripts are stored in the jamfsoftware database, you can add a script to Jamf Pro using the script editor. In the “Computer Management” section, click Scripts . Use the General pane to configure basic settings for the script, including the display name and category. Note: If you do not add the script to a category, Jamf Admin displays the script in blue text in the Unknown category. Click the Script tab and enter the script contents in the script editor. 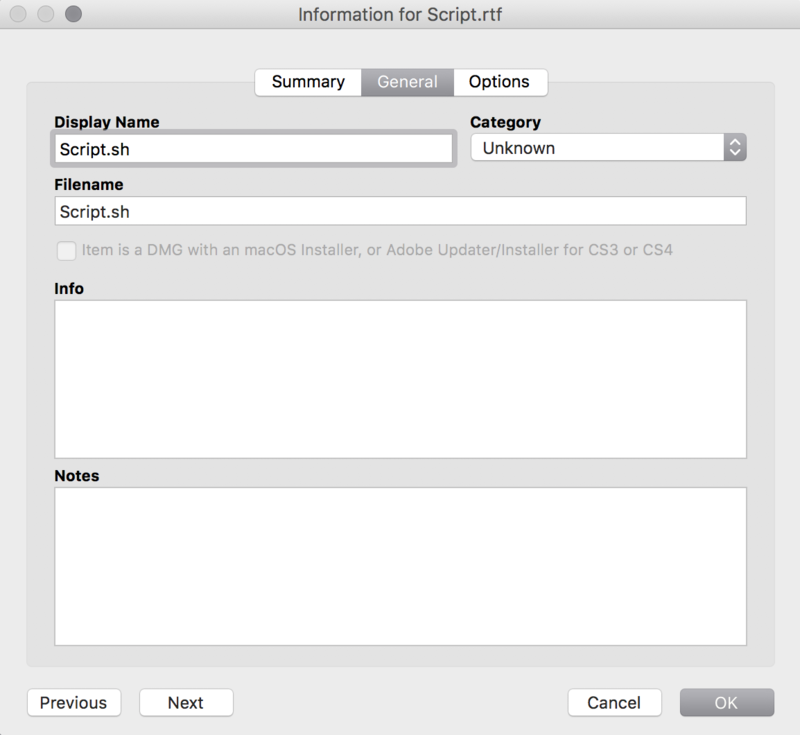 Click the Options tab and configure additional settings for the script, including the priority. (Optional) Click the Limitations tab and configure operating system requirements for the script. In the main repository, select the script you want to edit or delete. To edit the script, double-click it and make changes as needed. Then click OK.
To delete the script, click Delete and then click Delete again to confirm. If the script is stored in the jamfsoftware database, the edit or delete action is applied immediately. If the script is stored on your distribution point(s), the edit or delete action is applied immediately on the master distribution point. The action is applied to your other distribution points when replication occurs. Find out how to run scripts using a policy or Jamf Remote.